1906 2d Chalons Head 'Hausburg Reprint' imperforate sheet of 240 in black on thick white wove unwatermarked card, divided into 4 panes of 60, plus additional single copy. Lower right pane of 60 with printers repair. Also 1949 6d Green Kiwi and 1953 5d Blue Swordfish imperforate 116mm x 155mm facsimile's by Helio-Vaugirard (Belgium) on unwatermarked paper without gum. 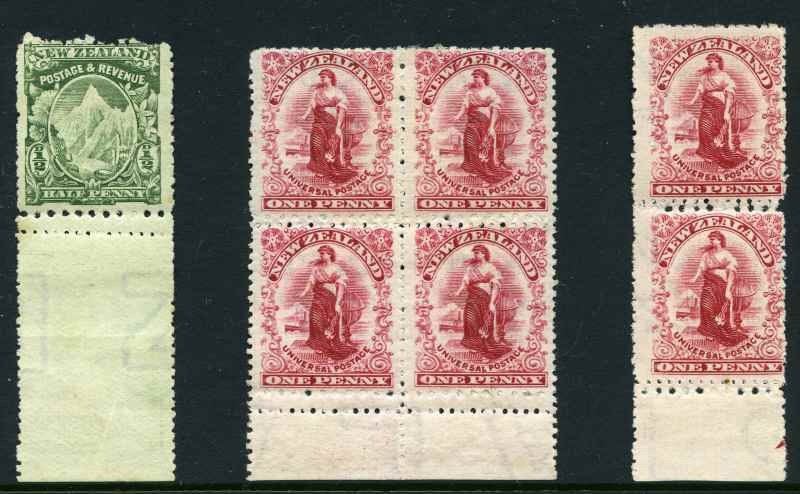 1900 ½d Green Mt Cook "Cowan Paper" Wmk NZ Star marginal single copy with mixed double horizontal perforation in margin and 1906 1d Rose-Carmine Universal "Waterlow" marginal block of 4 and "Royal" marginal vertical pair with mixed double horizontal perforations MLH. ½d Mt Cook with tone spots. 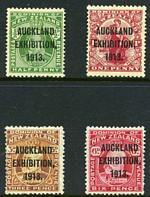 1906 Christchurch Exhibition set mint with hinge remainders. Sg 370-373. Collection of good to fine used stamps from 1909 to 1973 in loose leaf album. 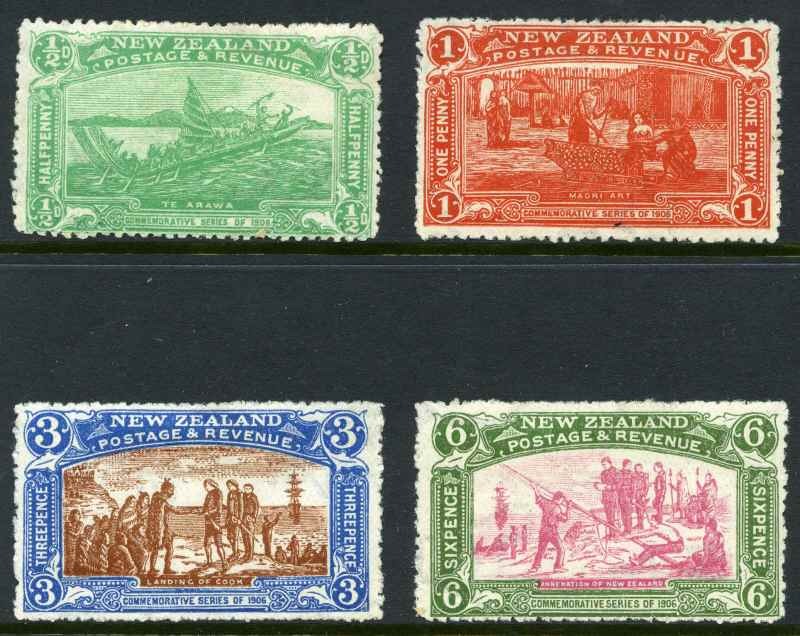 Noted 1920 Victory set, 1925 Dunedin Exhibition set, 1929 1d Nurse, 1930 1d Nurse, 1931 Smiling Boys set, 1931 Airmail set, 1933 1d Pathway, 1934 7d Trans-Tasman Airmail and largely complete from 1935 Definitive set onwards including complete set of MUH Health M/S from 1957 to 1972. All Decimal issues MUH. Odd fault, but generally fine condition. 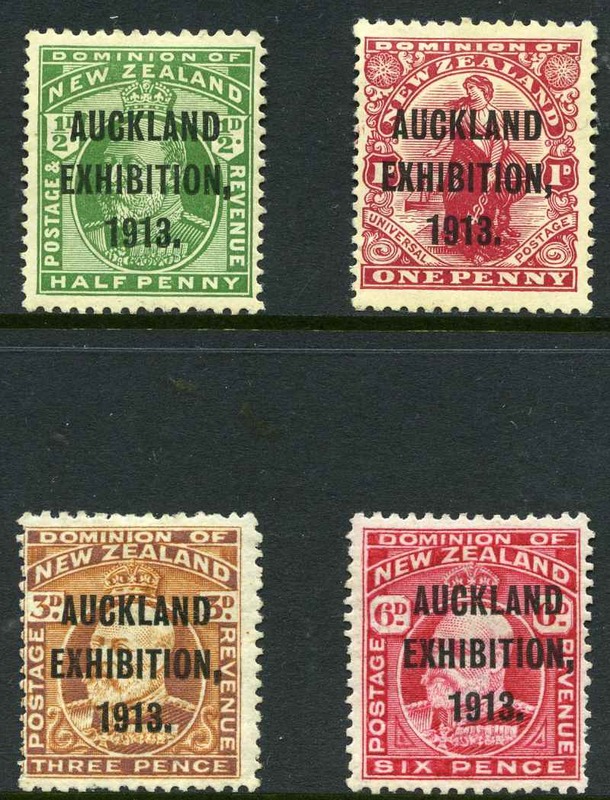 1913 Auckland Exhibition set mint with hinge remainders. 3d and 6d with few short perfs. Sg 412-415. Largely complete mint collection from 1935 Airmail set to 2006 Goldrush set on Seven Seas pages in 4 binders. Some early items FU and all issues from 1976 onwards MUH. 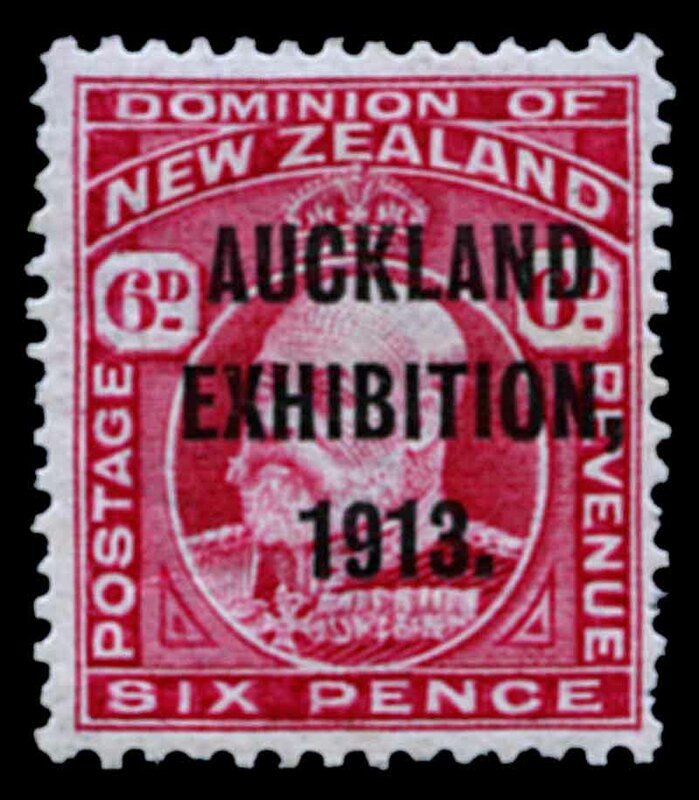 Face Value of Decimal issues NZ$1,869.00. Accumulation of 300 used $1.00 to $2.40 high value commemorative stamps on paper from 1980's to 2000's with varying duplication, plus 1993 $1.50 Dinosaur CTO with Wanganui cancel (50). 1984, 1985, 1988, 1989, 1990 and 1991 Post Office Year albums. Face Value NZ$203.74. Complete set Of Post Office Year albums from 1984 to 1991. Face Value NZ$263.00. Also 1990 New Zealand Heritage limited edition album. Complete set of Post Office Year albums from 1989 to 1993. Face Value NZ$233.00. 1993, 1994 and 1995 Post Office Year albums. Face Value NZ$200.35. 1994 Cricket, 1995 Butterflies, 1995 Maori Language, 1995 Rugby League, 1996 Famous New Zealanders, 1996 Race Horses, 1996 Olympics, 1997 Vineyards, 1997 Scenic Trains, 1997 Royal Wedding Anniversary, 1998 A New Beginning, 1998 New Zealand Art, 1998 Underwater World, 1998 1898 Pictorial Centenary, 1999 Native Tree Flowers, 1999 Scenic Walks, 1999 Yachting, 2000 Spirits and Guardians, 2000 On The Road, 2000 Threatened Birds, 2001 Garden Flowers and 2001 Aircraft special limited edition albums. Most contain a miniature sheet, set of stamps in pairs or blocks of 4, colour separations of the highest value, First Day Cover, imprint corner strips of 3 or blocks of 6 sets and detailed booklet with certificate of authenticity. 1994 Cricket without outer slipcase. All numbered 32/2000. Also 1990 New Zealand Heritage and 2000 Millenium limited edition albums. High retail value. Complete set Of Post Office Year albums from 1994 to 2001 including extra 1999. Face Value NZ$624.90. 1998 A New Beginning, 1998 New Zealand Art, 1998 Underwater World, 1998 1898 Pictorial Centenary, 1999 Native Flowers, 1999 Scenic Walks, 1999 Yachting and 2000 Millenium special limited edition albums with certificate of authenticity. Most contain miniature sheet, set of stamps in singles or pairs, colour separations of the highest value and signed FDC. All numbered 0796/2000. Also 1990 Heritage collection of MUH stamps and FDC's in special limited edition album. Very high retail value. Largely complete MUH collection from 1985 to 2010 including some duplication. Face Value NZ$2,266.70. Largely complete MUH collection from 1973 to 2001 including "Stamp Points" Best of 1997 (3) and 1999 (6) special packs and some duplication. Face Value NZ$1,806.50. Also 2000 Game Bird Habitat limited edition presentation pack. Collection of mint and used stamps from 1882 to 1986 on Seven Seas pages in 2 binders and Hagner album, plus 1984 (2) and 1985 Post Office Year albums. Majority of Pre-Decimal and early Decimal issues good to fine used, including handy items and some duplication. 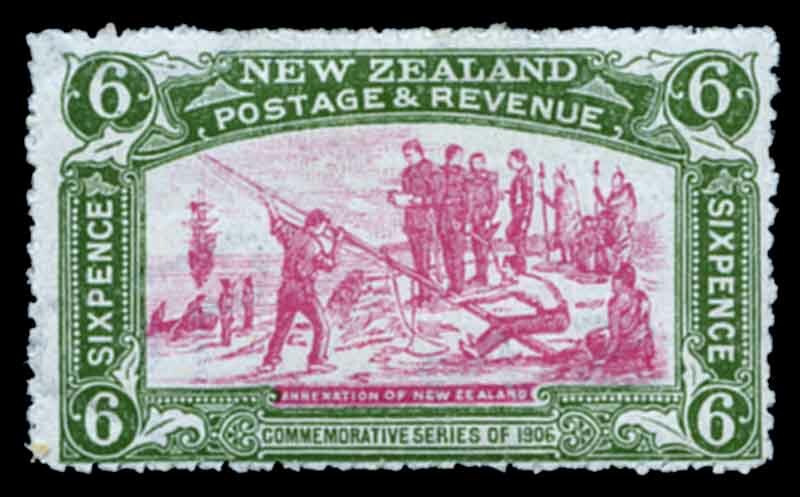 Face value of MUH Decimal issues NZ$413.00. Accumulation of 300 used $1.00, $1.10, $1.20 and $1.50 high value commemorative stamps on paper from 1980's to 2000's with varying duplication, plus 1993 $1.50 Dinosaur CTO with Wanganui cancel (50). Accumulation of 300 used $1.00 to $1.90 high value commemorative stamps on paper from 1980's to 2000's with varying duplication, plus 1993 $1.50 Dinosaur CTO with Wanganui cancel (50).